One of the nicest aspects of the jazz brother-and-sisterhood is that music eradicates many barriers less enlightened people mistakenly construct. When Louis Armstrong arrived in a foreign country whose language he couldn’t speak, the band playing STRUTTIN’ WITH SOME BARBECUE at the airport told him that everyone knew what to say and how to say it. Jazz critics construct Schools and Sects, so that people under thirty are supposed to play one way, people over seventy another. But the musicians don’t care about this, and jazz has always had a lovely cross-generational mentoring going on, where the Old Dudes (or the Elders of the Tribe or the Sages) took on the Youngbloods (or the Future Elders or the Kids) to make sure the music would go on in the right loving way. In theory, the Jazz Parents look after the Young’uns, but the affectionate connection works both ways: sometimes younger players bring back the Elders (Eva Taylor, Sippie Wallace, Jabbo Smith) from their possibly comfortable retirement, find them gigs, make sure that the audience knows that the Elders aren’t dead and can still swing out. When the partnership works — and it usually does — everyone feels good, especially the listeners. 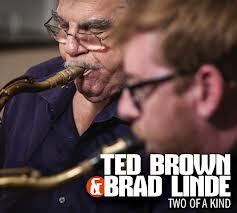 One of the most rewarding examples of this has been the side-by-side swing partnership of tenor saxophonists Ted Brown (now 85) and Brad Linde (now 33), which I have followed and documented in a variety of live appearances in New York City, the most recent being a wonderful evening organized by Brad at The Drawing Room in Brooklyn in December 2012, to celebrate Ted’s birthday. Another celebration is the new CD by Ted and Brad — TWO OF A KIND (Bleebop Records # 1202). It reminds me of the Satchel Paige line about age: it was all about mind over matter, and if you didn’t mind it didn’t matter. Or words to that effect. If you closed your eyes while listening to this delightful CD, you wouldn’t hear Elder and Younger, you wouldn’t hear Master and Student. You would hear two jazz friends, colleagues, taking their own ways on sweetly swinging parallel paths to a common goal — beautiful arching melodies, interesting harmonic twists, and subtle rhythmic play. And the material is both familiar and fresh — Ted’s original lines that twist and turn over known and time-tested chord structures: SMOG EYES, SLIPPIN’ AND SLIDIN, and his new tribute to Lester, PRESERVATION, and Lester’s blues line POUND CAKE. Warne Marsh, Lennie Tristano, and Lee Konitz are happily in evidence here as well, with Warne’s BACKGROUND MUSIC, the theme from Tschaikovsky’s Opus 142 that Ted and Warne recorded together on a classic session, Konitz’s LENNIE’S, and the indestructible MY MELANCHOLY BABY and BODY AND SOUL. It’s a delightful CD — on philosophical grounds of music transcending artificial definitions and barriers — beautifully recorded, full of feeling and sweet energy. No abrupt shocks to the nervous system, no straining after novelty — just evocations of a world where melody, harmony, and swing rhythms have so much to offer us. Thank you Brad, Ted, Tom, Michael, Don, and Tony. Visit Ted’s website here; Brad’s here. I was originally considering titling this post BEAUTIFULLY OLD-SCHOOL, but realized that not all of my readers would take that as a compliment. I don’t mean that TWO OF A KIND consciously tries to make it sound as if life had come to a graceful halt in 1956, but if one heard this CD playing from another room, one might think it was a newly discovered classic Verve, Vanguard, or Contemporary Records issue — because of the great ease and fluency with which the players approach the material and intuitively understand their roles in an ensemble. The young players — although not known to me — are just splendid, as individualists and as a cohesive rhythm section. Michael Kramer, guitar; Dan Roberts, piano; Tom Baldwin, string bass; Tony Martucci, drums, work together as if to the late-swing / timeless-Mainstream manner born, and if I heard sweet subtle evocations of Mel Lewis, Ray Brown, Tal Farlow, and Jimmie Rowles, no one would blame me. If you have never heard Ted and Brad together, here they are at The Drawing Room — playing BROADWAY with Michael Kanan, piano; Murray Wall, string bass; Taro Okamoto, drums. Sweet swing, gentle urgencies, messages to send throughout the universe.